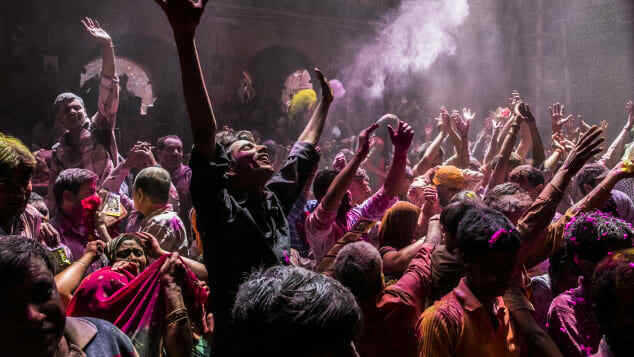 It’s the bold image of India most often seen in ad campaigns, films and music videos: People coming together from all walks of life to sing, dance and splash their friends and family with colored powder and water. Brands such as Sony and Canon have used the vibrant festival to showcase their products. British Airways recently joined in the fun with cabin crew members celebrating in cities across India. Before you travel there to celebrate it, you’ll want the answer to these questions: What is Holi? And why do Indians celebrate it? Hindu devotees play with color during Holi celebrations at the Banke Bihari temple in 2013 in Vrindavan, India. 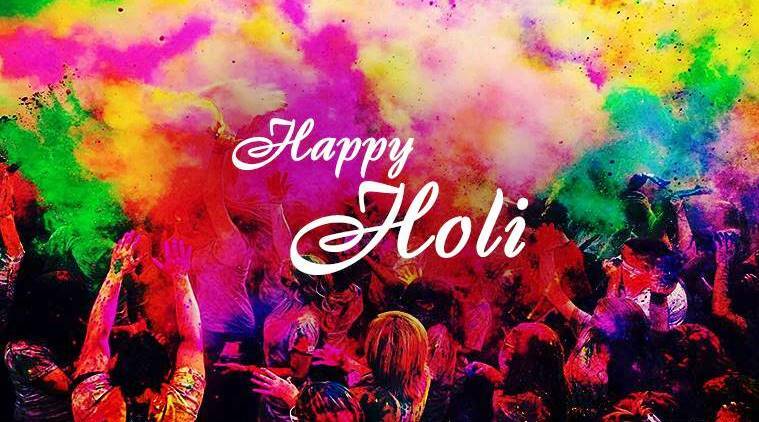 Holi is a Hindu festival that marks the start of spring. Celebrated across India, it’s an ancient festival with the first mentions of it dating all the way back to a 4th century poem. It was even described in detail in a 7th century Sanskrit play called “Ratnavali,” written by the Indian emperor Harsha. “Witness the beauty of the great cupid festival which excites curiosity as the townsfolk are dancing at the touch of brownish water thrown … Everything is colored yellowish red and rendered dusty by the heaps of scented powder blown all over,” wrote Harsha. 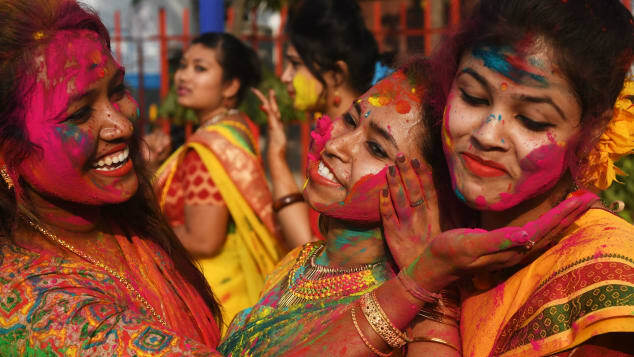 Indian students smear colored powder during an event to celebrate the Hindu festival of Holi in Kolkata in 2018. Although a Hindu festival, Holi is celebrated by Indians across the country and is a great equalizer. Children can douse elders with water, women splash men with color and the rules of caste and creed are briefly forgotten with everyone taking part. The evenings are spent visiting friends and family. A national holiday, it takes place on the last full moon day of the Hindu lunisolar calendar month, which is usually March. This year’s national holiday falls on Wednesday, March 20. The festival takes place a day earlier in the eastern states of West Bengal and Odisha. In some parts of northern Uttar Pradesh state, the festivities take place over a week. 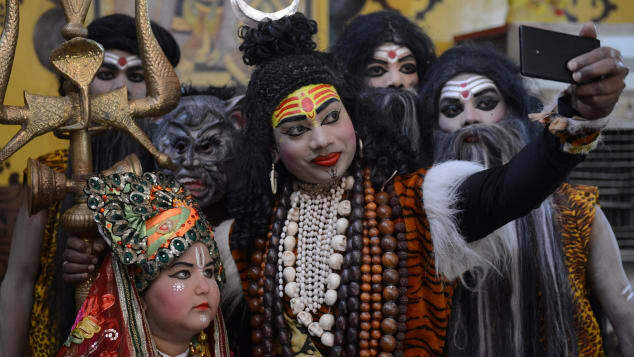 An Indian artist dressed as Hindu god Lord Shiva takes part in a procession ahead of the Holi festival in Amritsar in 2018.